Founded in 1968, CAO is rich with history, but the passion of its people is creating new and exciting cigars with rare and unique tobacco blends. Bringing CAO's Pilon (pronounced pee-'lohn) cigars to fruition required drawing from both. Using an 18-month long fermentation technique that dates back to old-world production of Cuban cigars, tobacco leaves are hemmed together and stacked layer upon layer in a circular pattern termed the round pilon. This method of natural fermentation maximizes the flavor and color of the leaves, giving the medium- to full-bodied Pilon cigars a richer, more complex taste not possible to achieve through modern methods. These premium cigars are handcrafted with a blend of Nicaraguan binder and fillers wrapped in a beautiful, chocolate colored Ecuadoran Habano leaf that offers cigar lovers a remarkable depth of flavor with notes of wood and spice, and a touch of sweetness. 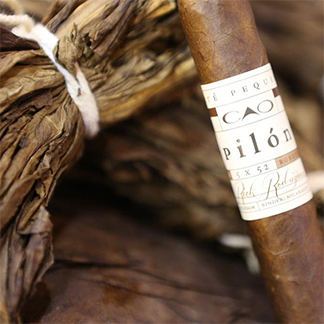 Smoke a CAO Pilon and you'll likely agree the round pilon process is a welcome return to the world of cigars.